RSS315HF-4 as the anchor of a 3-way??? Well, I've been contemplating a 3-way with the RSS315 for a while now. I modeled up what I'd consider a fairly beefy setup. 3 cubic feet tuned to 16.5Hz using a 15" PR from AE Speakers. Baffle diffraction simulations were generated with Jeff B's tools and BDS, traces taken from Zaph and PE for the mid, tweet, and woofer respectively. 200 and 1400Hz on the XO points. It might be here sooner than I thought!!! Re: RSS315HF-4 as the anchor of a 3-way??? Perfectly reasonable. 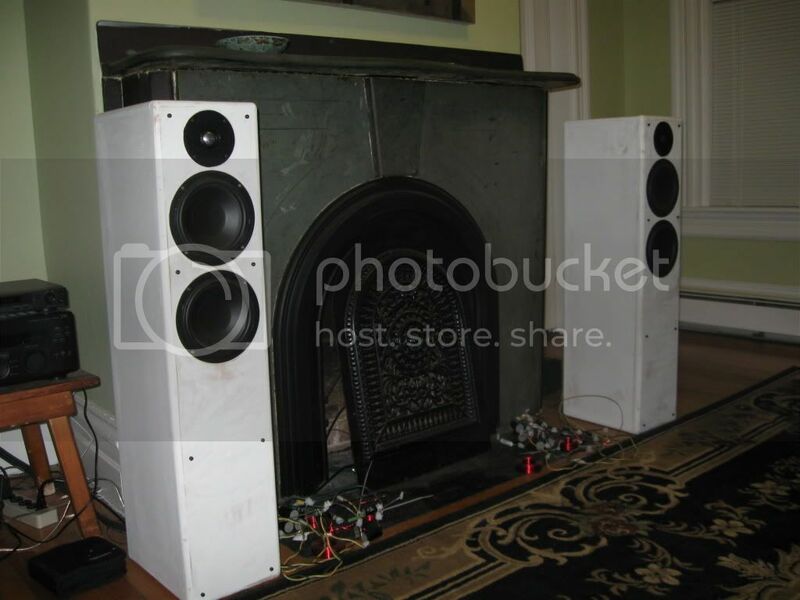 The biggest issue is whether one wants the subwoofer in the same location as the "mains" . . . because of the different relations to room acoustics the best (or the predetermined) location for the mains is not always best for the sub(s). It's a generic "all-in-one" problem. Of course if the location works for both it's not an issue, but . . .
A RS180 would work just as well as the Usher over that range, and it's a natural application for active crossover (you should try that right hand side of the PCD spreadsheet sometime ;)), but that would make a different loudspeaker . . . Cool! I'll be following this one with interest. I have two of those subs waiting in the wings for a similar purpose (but will be sealed, and with different mids and tweeters). Were there other mid options you considered? I'm always interested in people's decision making processes in speaker design. Is it a single cabinet design or are the subs in a separate enclosure? That thing is going to be heavy! pete mentioned it would be two boxes. 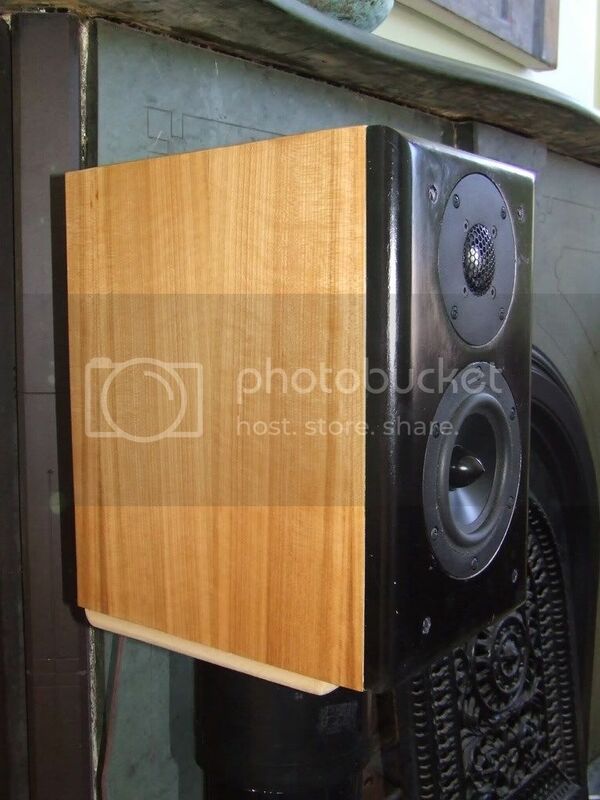 I have these as mtm/woofer 3 ways they use active crossovers. the mtm uses pe's bi amp plate the woofer uses a reckhorn crossover. these cost more but I have a feeling pete's will sound as good. I was inspired to do this by building and listening to Jeff B's Dreydel. He sent me an option that uses the RS28 instead of the 27TDFC, and my thoughts naturally drifted to adding a substantial low end to it. I heard the Marcatos by Paul K in Iowa, and they were simply wow. That's the only reason I modeled with the Ushers first. While the woofer and tweeter are set, the mid isn't. The RS180 might work, and the RS150 as well, but they'd most likely have to be the 4 Ohm version to reach the required sensitivity. The XO target above was achieved with only .8 Ohms of padding on the RS28 and none on the Usher. The RS180 is a couple dB less sensitive than the Usher. But, the RS180-4 will likely work, with just a touch of padding. Active is not an option on this build. I want this to be a traditional full range 3-way that can be driven with a 250W stereo amp and laugh. I modeled room effects for placement in my particular living room, and while peaks and nulls will be present, the fact that there are two distinct stereo sources for bass to below 20Hz should help smooth out room effects. Hey Pete, just wanted to offer my opinion that the 8948A is better for the application you have here than the 8945P. I understand why you choose the P, because Zaph has no measurements of the 8948A. I've had multiple computer failures since then, but I might still have my measurements somewhere. I remember the 48A having a bit smoother FR, less of the (presumably) surround resonance bump/dip. It looks more like the 45A without the 6khz breakup. And my distortion data showed essentially a dead heat, 45P might have a tiny edge below 150hz, but from there up they were both incredible and evenly matched. 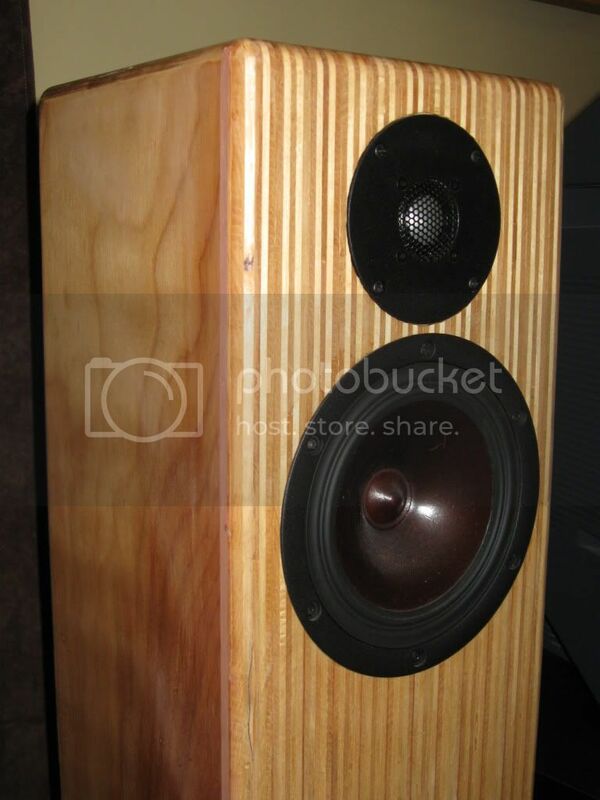 About 18 months ago I bought a pair of both drivers, and made a pair of bookshelves with each using the DXT tweeter. The purpose was solely to determine which driver I prefered. After listening to the Usher Tiny Dancers quite a bit at RMAF I figured the 8948A deserved investigation. My subjective impressions were that the 48A is just more neutral, more musical. It has just a bit of a softer delivery without any loss of detail, this bit of softness lets the stage go deeper and wider. Either is an incredible driver, the 45P looks meaner But I think the 48A sounds a hair better. I'm also going to look at the Peerless 830883. MarkK's non linear data on the Peerless is absolutely top notch, and PE is carrying them too. I just wish the basket was black . . . but it's not a total deal breaker. By the way Ryan, I was hoping to get your feedback on the final voicing. Wanna get to InDIYana? First step is to pull all the driver leads out to the back of the enclosure and put the crossover(s) in a separate box by the amp. That way the upgrade to active doesn't involve any change to the speakers at all . . . even the cable is in place . . . Right, the FR I got for the 8948A was very close to the 8945A. I also measured 2 8945P's and got FR data almost identical to Zaph's. Can't go wrong with either though. Those silver baskets are pretty easy to paint btw, I did that to a pair of 830884's and it turned out looking factory. Just leave the backside silver and tape everything off nice. I might be up for InDIYana, but certainly would be available to help with final measurments and tweaking the voicing. I have a ridiculous amount of x-over components, clip leading in small changes in values would be easy, and you wouldn't need to buy all the extras. Awsome, thanks for the offer!!! I've PM'd you. Pete, what about the ER18? It seems to have gotten a lot of rave lately. Yes indeed. That is a candidate I had omitted. I think I have to exclude the Usher for now due to the Vas. And since the Usher and SEAS units almost duplicate each others parameters, I just have to exclude it. The 830883 has half the Vas value and higher Fs. It likes a smaller enclosure better than the other two. I'm torn between using a 6" mid and a 7". The RS150-4 looks like a perfect fit, and I know how it (150-8) sounds in the Dreydel, the HOSS, the Khanspires, and it's wonderful. But it's only a 40W driver while the 830883 handles 100W. That is something to consider when power levels start warming up the coil. RS180? It sounds as good as (or better than) the 150, has plenty of oomph, and really likes the PE .38 ft cu enclosures (which makes things easier for the non-cabinet-makers who might want to try the design. I know, I know, it seems so . . . pedestrian . . . and doesn't cater to the driver-du-jour crowd . . . but there really isn't anything much, if any, better for under a couple hundred bucks.